Appearance in the university newsletter! – Dominican Health e.V. Appearance in the university newsletter! Our study project was listed in the newsletter of Furtwangen University. 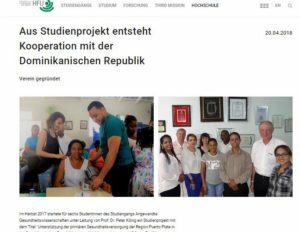 The article is about our founding of the association and the resulting cooperation between Furtwangen University and the University “Pontificia Universidad Católica Madre y Maestra” (PUCMM) in the Dominican Republic.